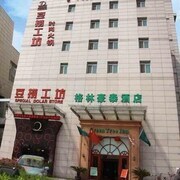 Located in Xinbei, this hotel is 2.6 mi (4.2 km) from China Dinosaur Park and within 6 mi (10 km) of Tianning Temple and Tianning Tower. best hotel in the area by western standards. Only complaint is the sauna/steam is never prepped in the morning, so you have to wait 15 minutes for it to warm up. Surely the staff could turn it on first thing when gym opens??? We stayed in this hotel for 8 days. 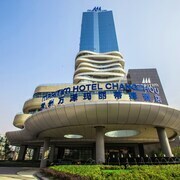 The hotel is located in the new district of Changzhou. There are several bus lines at the door step of the hotel. The hotel looks quite new and very clean. The complimentary breakfast was very good. I was particularly delighted with the quality of the coffee served in the morning. Our stay in the hotel was in the mid of November. The outdoor temperature was around +10C during our stay. The lobby and the breakfast area were quite cold for someone like us from North America as we are used to some 20C indoor temperature. No heating was provided in the first few days of our stay, making in-hotel dinning quite an unpleasant experience. After my complains to the management during our evening dinning in the hotel, heating was turned on in both the lobby and the breakfast area the next day. Although our room was quite clean, there as an unbearable smell from the washroom. We had to keep the exhaust fan running 24/7 in order to lessen some of the smell. After a bit investigation, it was found that the smell came from the drain opening, both in the shower and near the toilet. The same smell was also spotted in the main washroom in the lobby. Looks like major sewage cleaning is needed. Where to find Changzhou hotels near an airport? How can I find hotels in different Changzhou neighborhoods? Where can I find hotels in Changzhou that are near tourist attractions? 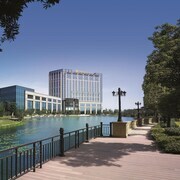 Expedia.ca offers a selection of 163 hotels in Changzhou. You are sure to find cheap deals and discount rates among them with our Best Price Guarantee. No matter what type of hotel strikes your fancy, we will let you search for your preferred one to accommodate your travel needs. Expedia.ca will not only save you time, but also money when booking your stay at a hotel in Changzhou. Making reservations so you can stay within your budget is easy with us. Expedia.ca even provides you with a map so you may find hotels in the Changzhou neighborhood you prefer. Go ahead. Enter your travel dates to view the best offers on hotel rooms in Changzhou, Jiangsu now! 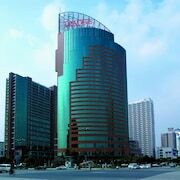 What are the most popular Changzhou hotels? 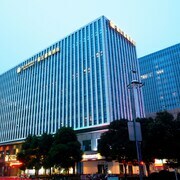 Are there hotels in other cities near Changzhou? What other types of accommodations are available in Changzhou? Explore Changzhou with Expedia.ca’s Travel Guides to find the best flights, cars, holiday packages and more!